Today I started a temporary diet to jump start my weight loss.....a soup diet! It started out ok, but honestly, I am starving right about now, but I can have fruit so I will be snacking on some fruit before bed time. This is the soup I had for lunch & dinner today. 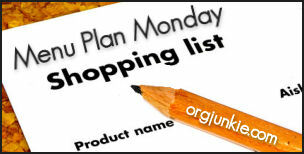 Stop by I'm an Organizing Junkie for more menu plans!